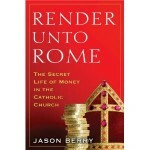 David speaks with author Jason Berry about his book Render Unto Rome: The Secret Life of Money in the Catholic Church. This book chronicles decades of secrecy, scandal and deceit in the Catholic church, but not on the expected subject matter. Instead this book examines how the hundreds of millions of dollars in weekly tithings from congregations worldwide is spent and accounted for from local diocese to Vatican City.